Millwork throughout the house was replicated; paint colors are based on evidence in the house and colors typical of the period. Over the past 27 years, Janet and Jim Laverdiere have, with the help of restoration experts, restored nine homes of their own while raising a family. Jim was running his manufacturing business (Kleenline Corp.), but there was always a house project going on. Jim sold his company in 2013 and, after buying the Holman House shown here, decided to turn his hobby into a business. Fine Period Homes was founded in 2014. The company of highly skilled tradespeople selectively chooses important or endangered houses to restore and bring to market. Every period architectural detail in this magnificent ca. 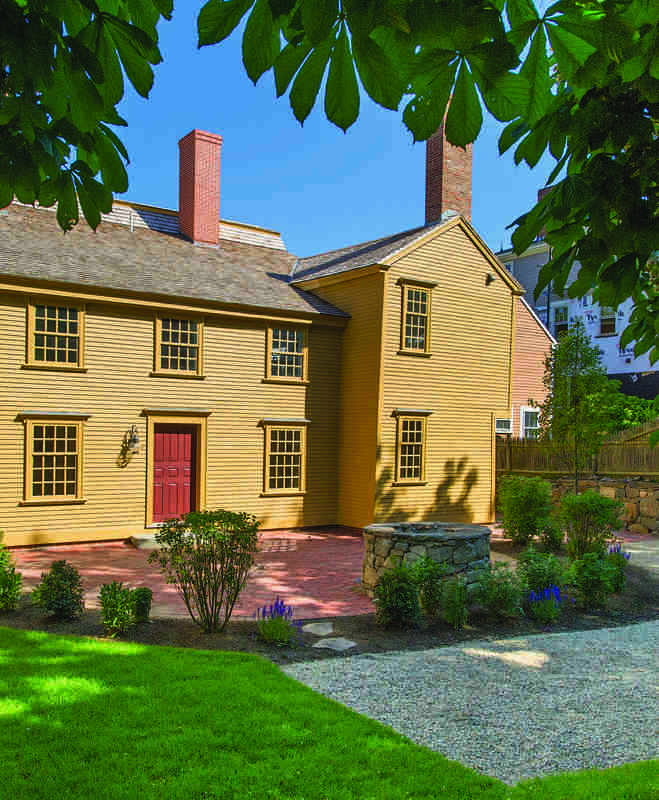 1744 Georgian home has been meticulously restored; all 12 original fireplaces—two now in bathrooms—have been preserved. 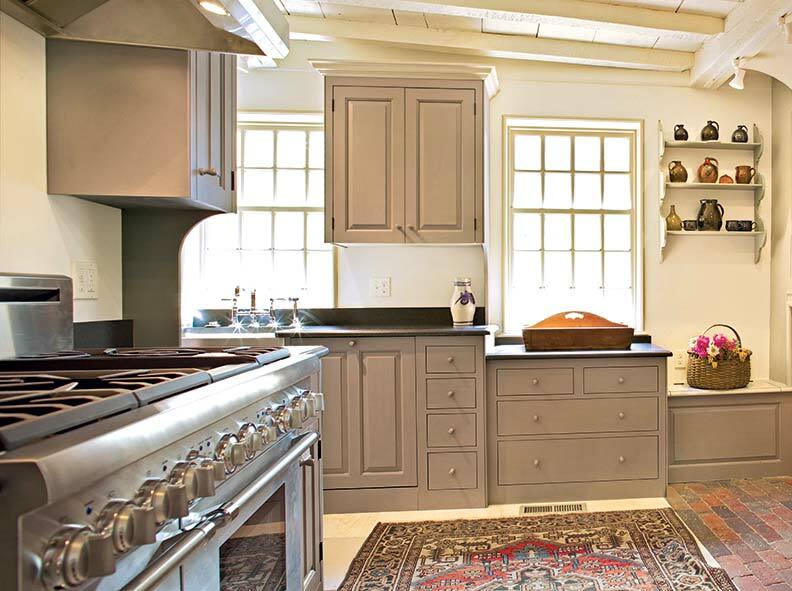 The Holman House in Marblehead, Mass., is the first project of Fine Period Homes, founded by serial restorer Jim Laverdiere to turn his “hobby” of many years into a business. The bump-out on the side rear is an addition of 1802. Every inch of this house on a main street in the old seacoast town needed restoration, repair, or reproduction—from structural members in the roof and basement to fine mouldings. The 12 over 12 windows are new: bench-made and plank-framed in mahogany by Architectural Components. Skived cedar clapboards are fastened with forged rosehead nails. Interior walls are plaster over wood lath. Much of the new trim and crown moulding was reproduced using hand planes. Fitted into the existing addition, the kitchen has an unusual plan that nevertheless works, as the layout created usage zones. Storage is tucked next to the old hearth, with a cooker opposite and a cleanup area adjacent. 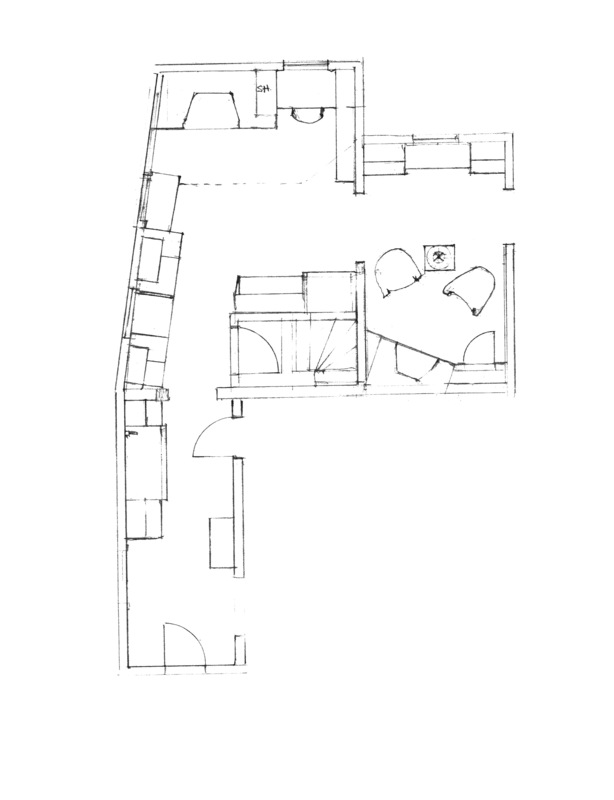 A corridor became a practical butler’s pantry next to the dining room; the space terminates in a small powder room. 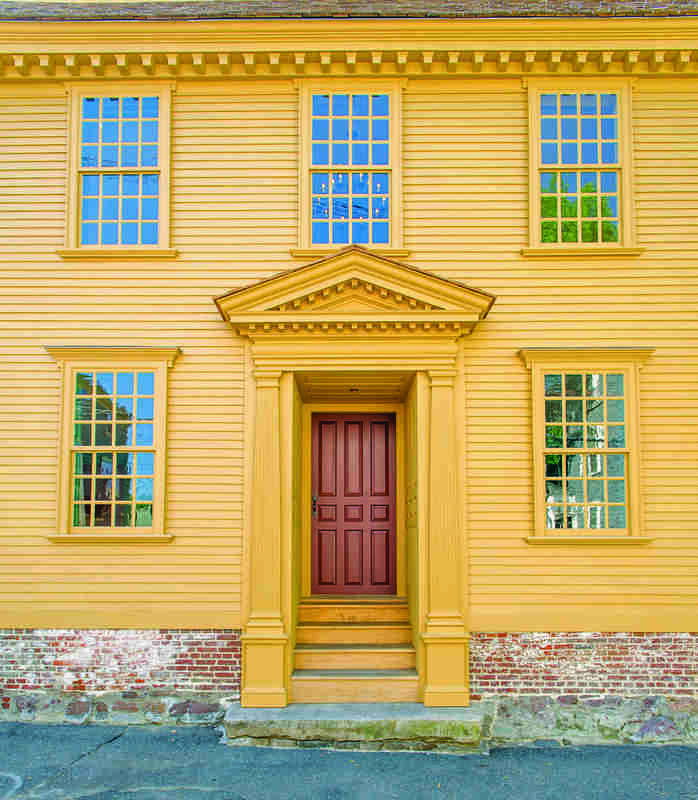 Laverdiere worked closely with The Kennebec Company on the design, asking them to copy the raised-panel profiles from one of the original 18th century doors in the house. 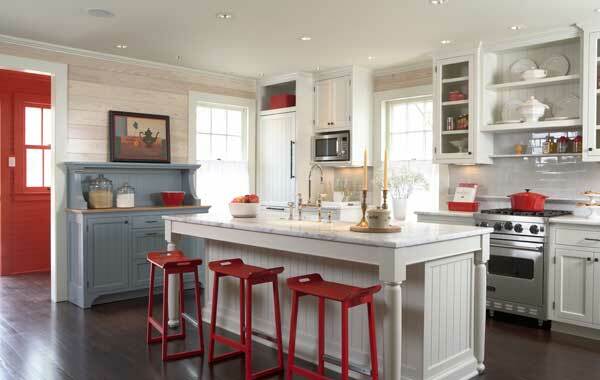 (The cabinets are painted in Benjamin Moore’s ‘Alexandria Beige’.) 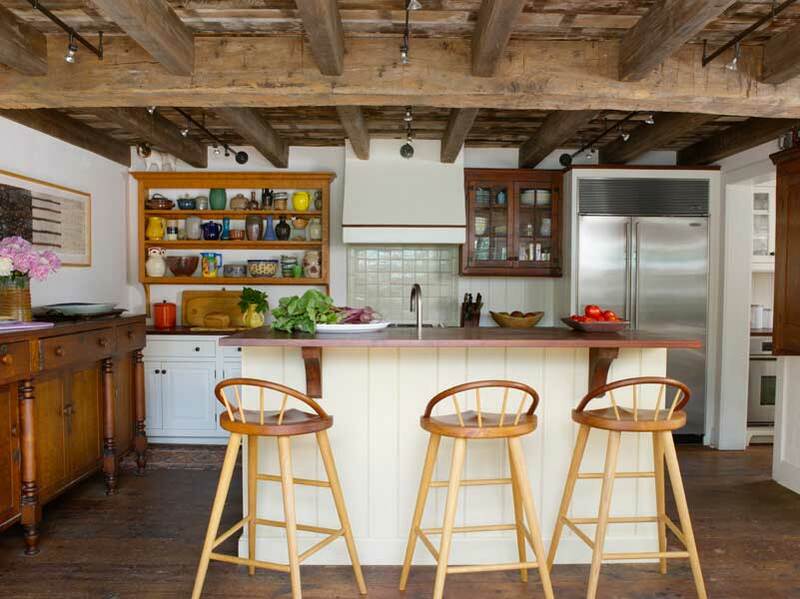 The space includes an abundance of period-appropriate shelving and cupboards. Georgian trim was reproduced for the fireplace surround in the kitchen; another fireplace warms the tiny breakfast room nearby.